Yesterday evening I have suddenly realized that I don’t have any photos to post for today edition of Photographic Fridays, I didn’t want this category to be a still born like the erstwhile Calvin fund 😀 So I took out the D40 and marched out of house in search a subject worth my clickitch. While walking outside the apartment complex spotted this ominous looking traffic sign and I instantly knew what sepia tone could do to this. So there you go. Now tell me, where do you want to go today? Left, Right or Straight ? nice one buddy... 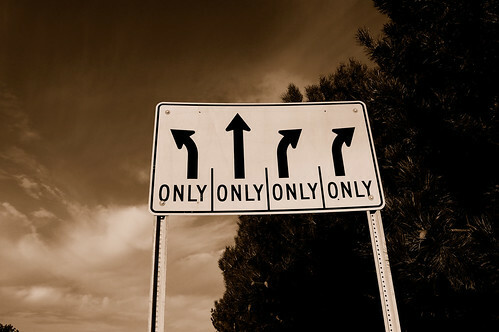 I'll let my laziness decide which direction I want to go!! !